B.I.G. Tips – Let the Earnings Season Begin! Earnings season kicks off this week as some of the major banks are set to report Q1 earnings. JP Morgan (JPM), PNC, and Wells Fargo (WFC) will all report Friday morning, and then Citi (C) and Goldman (GS) will report Monday morning. Outside of the big banks, the only other reports of note this week are Delta (DAL) on Wednesday morning, Bed Bath & Beyond (BBBY) on Wednesday afternoon, and Rite Aid (RAD) Thursday morning. Things don’t really start to pick up, though, until next week, and the peak reporting day will be on 4/25 when 64 companies in the S&P 500 are set to report. Given the equity market’s strong performance during the last earnings season, it’s going to be hard to get a repeat performance. That doesn’t mean returns can’t be positive, but if you are expecting anything resembling the last earnings season, you’re being way too greedy. 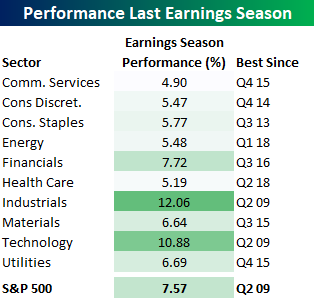 The table below shows the performance of the S&P 500 and each sector during the Q4 earnings season (1/11—2/22) and how that performance ranked versus prior quarters. With a gain of 7.57%, the S&P 500’s performance was the best earnings season showing since the Q2 2009 reporting period. Industrials and Technology were the same with a gain of 10.9%. Other sectors with notable performance relative to recent history included Consumer Staples (best since Q3 2013) and Consumer Discretionary (best since Q4 2014). To gain access to the full report which provides a detailed look at how the S&P 500 and individual sectors have performed during prior earnings season based analyst sentiment heading into the period, please start a two-week free trial to our Bespoke Premium package now. Here’s a breakdown of the products you’ll receive.